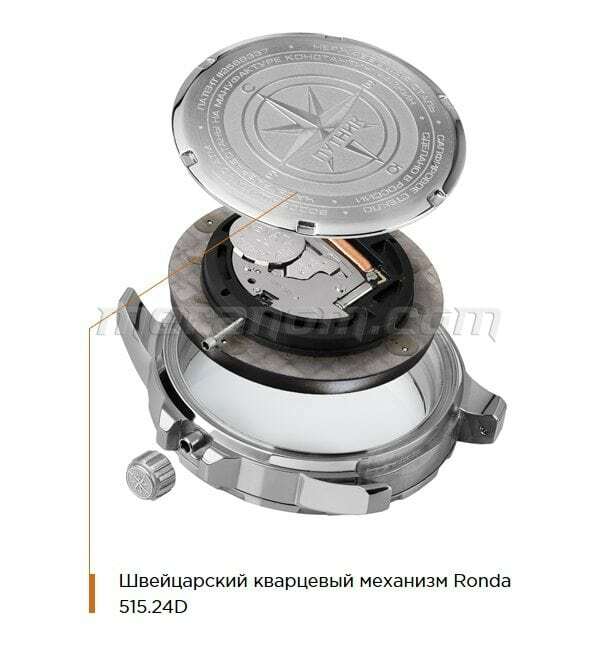 Ronda Powertech 515.24 D Swiss Quartz Movement. 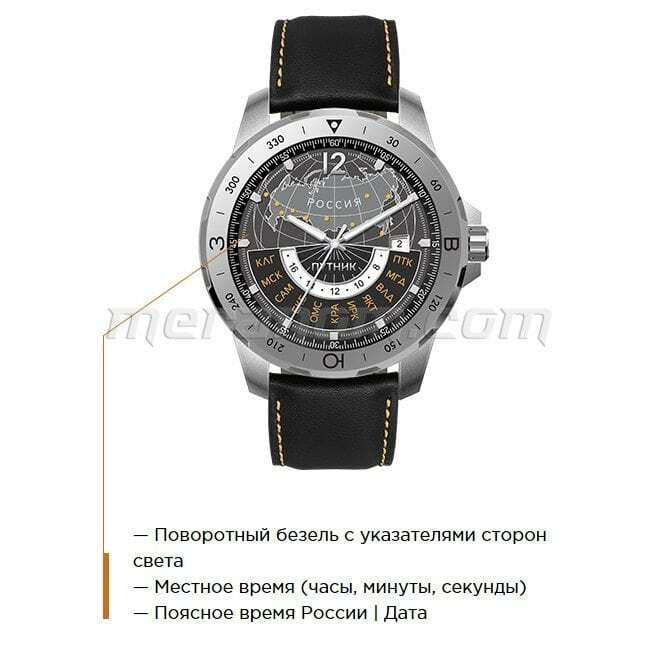 Functions: center hour, minute and seconds hands, date, all Russia time zones display. 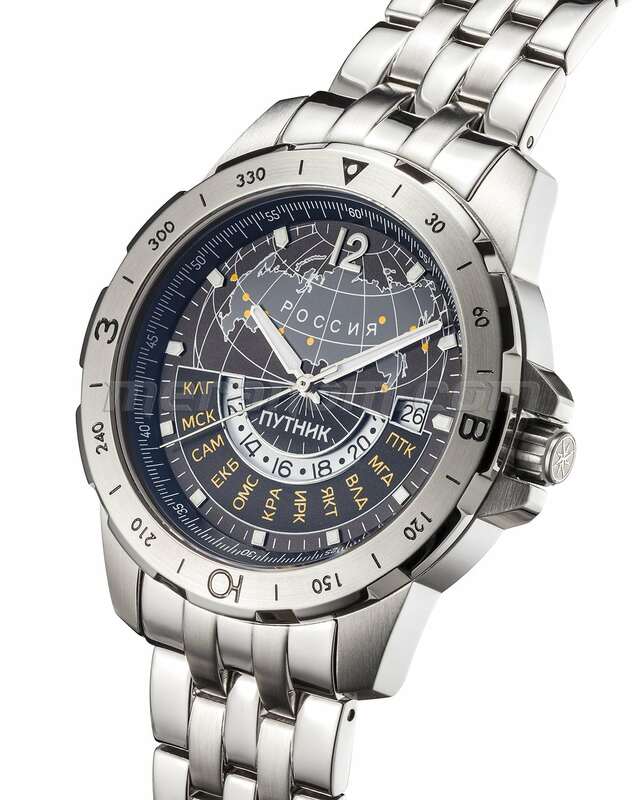 solid steel case back with embossed stylized image of the solar compass. 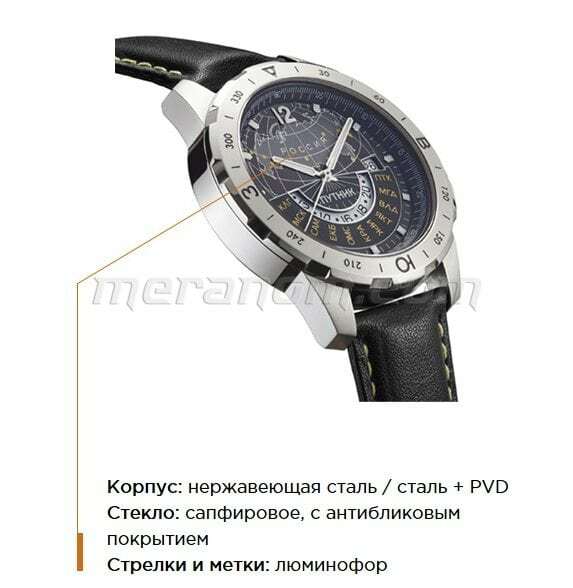 Dial: green, blue or black, decorated with polychrome lacquer, hour indexes and hands with luminouse. or stainless steel bracelet with folding clasp. "Konstantin Chaykin" Russian Watch Factory present unique development "Putnik" (means Traveller) a watch is made on time indicator construction showing time simultaneously in all time zones of Russia (Patent RU2568337). It’s a simple design. There is 24 hours turning ring in semi-circular window for eleven time zones, located in the lower part of the dial. КЛГ – Kaliningrad, Kaliningrad time (MSK-1). Local time is shown by the central hands and isn’t dependable on time zone indicator and could be adjusted separately. 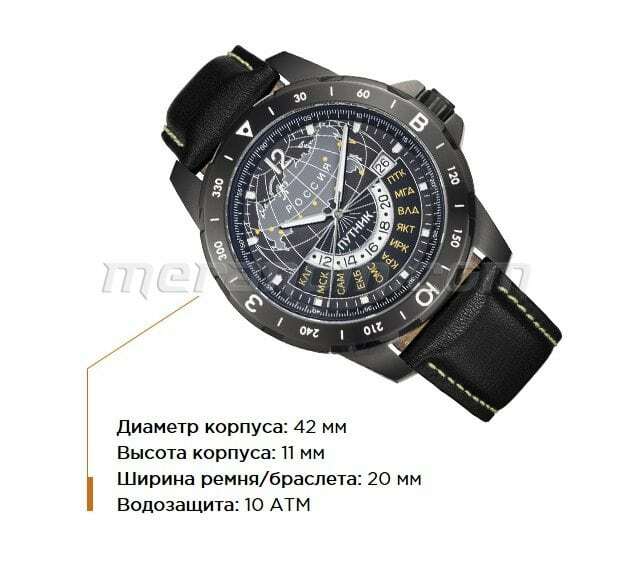 "Putnik" watch could be useful not only on traveling from airport to airport, but in an unfamiliar area, on the turning bezel of "Putnik" watch dealt 360-degree scale solar compass. It allows the Sun's position and the current time accurately determine the location of the cardinal points. 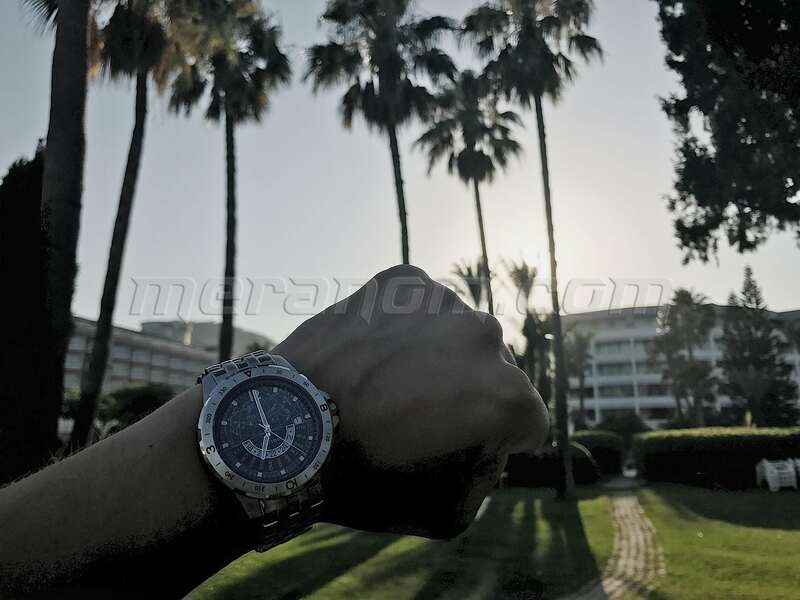 For this you need to place the watch horizontally and direct the hour hand at the Sun. 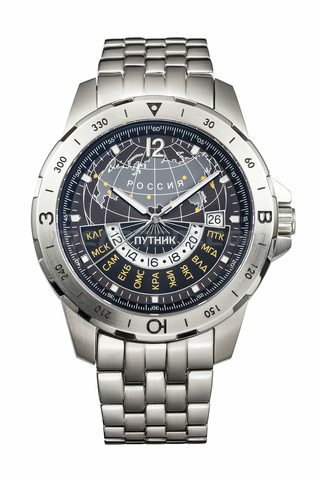 Then you turn the bezel so that the mark "S" indicating the direction to the South, was halfway clockwise to the 1 hour mark on the dial. This will be the desired direction to the South. Часы отличные. Цифер очень красивый. Заводная головка без обработки, но можно отнести к особенностям дизайна. .
Браслет не плох, но застежка самая дешевая штампованная, присутствует гравировка "Путник" надо либо менять застежку, либо вообще носить на ремне. Главное достоинство это циферблат, он великолепен. И диск с часовыми поясами тоже отлично вписывается. Здравствуйте. Какова ширина ремешка (браслета)? Спасибо. Подскажите, я так понимаю тут просто кварцевый механизм стоит?